A terrific brain trust of folks answered great questions that I’ve tried to aggregate into an organized list you may find very helpful. Enjoy! The Q/A was especially helpful and added a lot to the session. TIP: See the end of this post for other coverage on the conference too. works with lots of end users, so he wonders how we are telling these people these services exist and training for use? Worries about overload consumers getting confused. There are places for services that help eliminate “gaming” of reviews. Review aggregations. IVR / Voice Response will advance. This gets people excited. This gets your foot in the door, which is key. semapedia.com reference. sounds cool mobot. — camera phone searches are easy. Ask mobile is carrier agnostic – users with company phones cannot put stuff on it (e.g. google maps) – so ask.com’s stuff is built in. Ask doesn’t put search box on mobile site, they just stack the information for quick navigation. Otherwise people start entering long, tedious searches – bad user experience! Surprised by limited conversation about social -> mobile. Issue is more lack of focus on interaction between users. SME usage will follow consumer usage. Trends are pointing in the right direction. Over longer term, we need to stop talking about application you use when you must, but more ubiquitous use. Like going from dial-up to broadband – everything changes. Another barrier is carrier structure – no innovation. Like Earthlink circa 1995. This is Holding back everything. Computers in Cars question: The problem is the auto industry, not the technology. Can’t drive and search easily. Lots of regs. Leaning on your friends to find new things will be important – facebook/myspace examples. Quality of results will depend on content, as well as algorithm. Where is advertiser interest – who will fill the gap? No conversation about local marketing video surprised her. Not a lot of solutions about off-line conversions surprised her. regarding reviews/social: Positive and negative reviews are just a normal part of the world. need to engage small businesses to provide information to send to mobile/local results, not just national franchises. Who’s paying for all of these innovations – consumers? advertisers? It won’t be carriers. future…Small businesses aren’t ready to be doing real-time inventories, etc. Accessibility lacking – devices must become easier to users. Real time location can enable ability communicate where friends are and even activities they’ve done / reviews. We try to weave in local search to SMS, put result on phone, etc. Michael Jones, Chief Technologist, Google Earth, Google Maps, and Google Local Search, Google, Inc. Lack of controversy. Galactic comment. CEO of Samsung said new corporate vision was to be like Google Sky, not like Sony anymore. They said that was the most creative thing at Google. Anything where something is ubiquitous changes everything. Google maps supports hundreds of platforms (mobile) behind the scenes. Auto industry can’t do anything that would get them into tort cases. Nothing will be in the cars… all add-ons. Quality of local search results is not as good as web results, need better sources. hears skepticism in the conference. Is there a tension being set up between needs of marketers and searchers. Like universal search, this makes it more challenging for marketer. There is a push-pull situation. 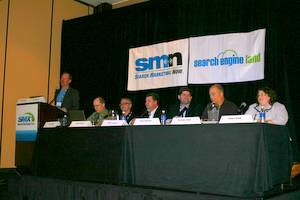 Many challenges for search marketers.